The chance to sit down with the inaugural Buildcorp NRC winning coach Nick Stiles was a great opportunity to see the NRC from the inside, and also to pick the brain a great forwards’ strategist with his eye on the future. Stiles has been signed by the Queensland Reds for three years as Senior Assistant Coach, which means that he also assumes the responsibility of Brisbane City Coach for the next three years – a welcome appointment for anyone who watched the forward pack develop first at City and then the Reds as he successfully integrated new blood in with existing and accomplished players. When we sat down to chat our focus was certainly on Brisbane City’s 2015 campaign but Stiles clearly has a mandate, and a responsibility as a Reds coach, to look forward to the Reds 2016 efforts. Anything he can build at Brisbane City is an advantage for the Reds in 2016 (and as a Reds fan, by golly we need it!). With Rod Seib (Sunnybank Coach and Brisbane City Attack Coach) and Shane Arnold (Australian Under 20s Coach and Brisbane City Defense Coach), Stiles felt it was a good opportunity to setup a culture for the team that could be long lasting, because the competition is here to stay and the team have a sense of that responsibility. Stiles was forthcoming about the success of the NRC over its predecessor the ARC, having been involved in both. The ARC was an ignominious attempt by the ARU in 2007 to be a 3rd tier competition. Stiles agreed that the ARU has learnt from their ARC mistakes when setting up the NRC (in his role as coach of the University of Queensland Premier Rugby team he was involved in the think tank that set up the ARC). One of the difficulties they faced was the fact that Melbourne for example, didn’t have a Super Rugby team, so the costs of running an ARC team were prohibitive. “The other thing was that they also tried to treat it like another tier of Super Rugby, travelling early, staying in nice hotels, all the 5 star stuff. The ARU have cut it [NRC] back to a level and I believe they are running it as it should be run; it is done on the cheap. It is more important that the players, the administrators, the coaches are all getting the games and the experience of the NRC as a pathway rather than living the high life”. 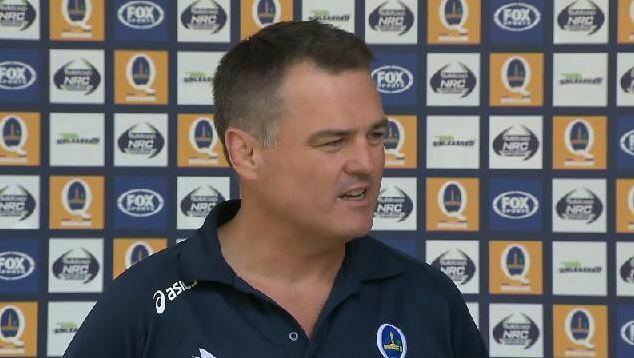 Stiles thinks that it is even good for the Super Rugby players to go back to a different level. When Brisbane City played Perth Spirit last year they flew in the night before the game, played the game and flew out that night; they flew down on the day of one of their Sydney matches – it is not a glamorous experience. The flipside is of course for the club rugby players who benefit from the additional support mechanisms that come with being an NRC player. From the QRU perspective, they are educating the club players about what it is like to be a professional footballer as well. “They get a taste of what Super Rugby is like from an organisational perspective, so that when they do get the opportunity through their ability, they know what to expect rather than go from club land straight into Super Rugby where you get spooked quite a bit by the goings on of a professional side”. Stiles highlighted that all athletes needs game time, and with this additional pathway to support the existing channels of school boys and Under 20s it makes the transition to Super Rugby that much easier. As a marketer I think the ARU are perhaps running it on the ‘too cheap’ – the lack of support by the ARU and the NSWRU is obvious and does contribute to the lack of awareness about the competition, particularly in a traditional rugby heartland like Sydney, and particularly for those outside the world of social media. Certainly, the deal with Foxtel to make all the matches available will help in 2015, but we all know rugby is battling against major sports with major dollars for the hearts and minds of Australians. Stiles knows this better than most, because it is a battle for the actual athletes in Australia, competing with the NRL and AFL for young players. In this he thinks we can’t really compare ourselves to New Zealand who have had a very successful comp in ITM, but having the NRC does put us on a similar path, and more rugby is the crucial thing to the success of the athletes and the teams themselves. “He is an inspirational player, his personality is that he just gets in there and gets it done. On field it’s the easy part. In terms of being an actual leader, that is a separate skill. Not only are you developing your club players to get them up to the next level, it’s the same with the Reds players, you are trying to give them different skills off the field in particular that they might not have worked on. It’s a great opportunity for a player like Liam to understand how you can influence the group off field, because on field is easy”. “We all know he’s not a 10, but to step in and play 10 at Super Rugby level for an extended period of time is a pretty tough ask and one of the things that NRC did for players like Nick is that he had been sitting behind Will Genia for years and it is easy to sit behind someone and float through the system and come on and play your cameo minutes. It is totally different to know that you are starting week in, week out and the preparation you have to do off the field for that success is different. “With NRC you have one full time coach and it forces the players to do more homework than they might be used to doing at Super Rugby level. Nick put a lot of work in Monday to Friday through NRC last year and performed really well. Once he slots back into 9 for the Reds the experience he has gained in the last 12 months means his football will be accelerated”. Stiles was open about the appointment of the Brisbane City leadership group. Everything he does for City is about trying to make the Reds better, “that’s a big driver, we want as much success as possible at the Reds and we’ve come off a couple of lean years. By giving official roles to Nick Frisby, Samu Kerevi, Sam Talaki and Karmichael Hunt you are effectively building skills to replace a group of people we have lost from the Reds in James Horwill, Will Genia and Quade Cooper”. “He was named in the Reds leadership group this year for a reason because when he is out there on field, the intensity he trains with, the influence he has on others around him is something we want to build. By putting him in the group we are enabling him to build confidence again, because it was a pretty tough year for him and this is another way of supporting him and getting him involved and hopefully have a better year next year. He needed to play rugby and unfortunately he wasn’t able to that consistently, but with NRC this year he should have a springboard to have a good 2016″. The law variations continue this year and Stiles is pleased for the opportunity to see whether they make a difference and whether it is sustainable. He was one of the coaches who thought that perhaps there should be have been a 6 point, 2 point split for the a converted try in the NRC. He makes a good point that the hard part is scoring the try and that kicking is a closed skill, so that perhaps rewarding the bulk of the effort would benefit the team, reserving just two points for conversions. Jake McIntyre certainly benefited from the number of tries with 23 conversions to his name last year. With such a focus on tries in the NRC, it certainly does allow the goal kickers more experience (and oh boy, Australian goal kickers at all levels need every chance they get to practice, 2015 was not a good year for us!). Stiles acknowledged that he focused on goal kicking depth this year when building the Brisbane City team. As a massive grassroots rugby fan, I love the NRC firstly because it just means more rugby and that is never a bad thing. Secondly, the NRC is doing exactly what it was designed to do – being a feeder into Super Rugby, a bridge between club rugby and provincial rugby. We have seen the fabulous results between 2014 NRC and 2015 Super Rugby with players like Samu Kerevi, Nic Stirzaker, Dane Haylett-Petty, Sam Talaki and Jack Debreczeni. It certainly wasn’t like all these players were unknown, some of them had played in Super Rugby before the 2014 NRC season. However, the step up they took in their Super Rugby franchises in 2015 was incredible. These players developed the ability to influence games, and we should expect to see more of the same this year in NRC and next year in Super Rugby. While there was a certain amount of excitement at the announcement of the Wallabies assigned to each of the NRC teams, many of them will see RWC action rather than NRC action. Perhaps less so for City because at this stage it looks like Higginbotham and Genia are on the out with Cheika so we should expect to see the in the yellow and blue for Brisbane City. “While I think it can be disruptive to bring players in and out of your squad, what these guys can bring in terms of their professionalism, you want the club players to see and be a part of. While someone misses out on a game here or there, what the group can pick up off them is invaluable”. Stiiles is certainly looking at combinations for the Reds in 2016 and is looking at a Frisby, McIntyre, Kerevi and Hunt combo, ” You are hopefully building some combinations and form that you can take into 2016″. Working with players like Pettowa Paraka, Sef Faagase, Andrew Ready and Sam Talaki through the NRC and then in a full pre-season program with the Reds meant that they could integrate well with existing and established players. Stiles believes that, “the current crop of props and hookers signed up in our squad are the best as a full group in Australia so it means when we do our scrummaging work at training it means we are scrummaging at Super Rugby level standard”. When asked where he saw Brisbane City and the Queensland Reds in 3 years time he acknowledged that they are in a transition mode and that when you look at the roster, a lot of newer players have been locked in for that period, “The younger group who came through the NRC last year like Adam Korczyk, Andrew Ready, Sam Talaki – the whole group showed they could perform and they have a lot of growth in them. I think it is a little bit like where the Reds were in 2008-09 with a new playing group, a lot of transition and they were able to push forward with hunger and drive for a title.”. When you look at the Reds team photo from 2009 you certainly hope that history repeats (as a Reds fan) – this team was a young team that went from 13th to 5th to winning the Super Rugby title. It had a mix of old heads and new blood. Stiles is certainly working towards that vision for both the Reds and Brisbane City. He talks about NRC as the purest form of rugby – it doesn’t have the same pressure of Super Rugby or Test rugby, “At Super Rugby level you live in fear of failure. If you cast your mind back to when you were a kid, why did you start playing rugby? Because you loved it, you enjoyed it. It wasn’t about winning, you played it because you enjoyed it. That was a message we really drove hard with the NRC in Brisbane City last year, trying to get them to run on to the field without fear of failure. That allows you therefore to play better rugby”. And right there, THAT is the reason we all loved the NRC last year and we are excited for the new season launching Thursday. An opportunity to step up. Played by people who love it. This post was originally published on GAGR.